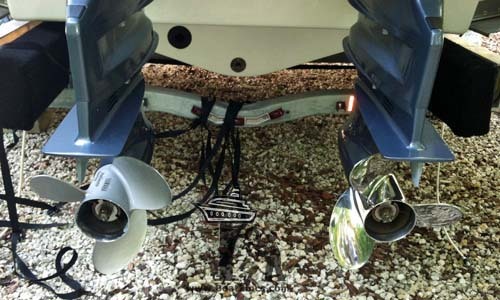 Poor DC ground connections between these two new Yamaha outboards is causing the Port engine to operate at a higher voltage potential than the Starboard engine. As a result, the Port propeller has become discolored after being electroplated by zinc metal ions from the the Starboard outboard's anodes whenever the Port engine is in use. The solution is to install a high quality battery ground cable between the Port and Starboard engine’s starter batteries. This keeps both engines (i.e., propellers) at the exact same voltage potential and eliminates electrolytic plating/corrosion between these underwater metals.